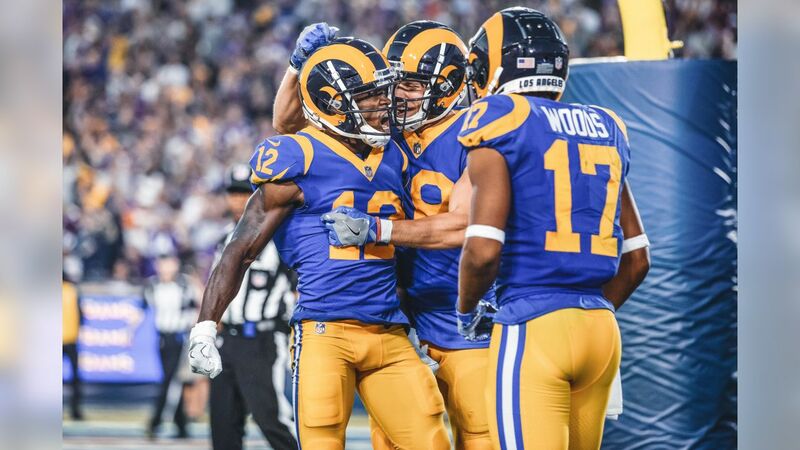 Los Angeles Rams wide receiver Brandin Cooks (12) celebrates his first Los Angeles Rams touchdown with wide receiver Cooper Kupp (18), and wide receiver Robert Woods (17) during an NFL Week 4 Football game against the Minnesota Vikings. The Thursday Night Football game was simulcast on NFL Network, FOX, and Amazon Prime Video at the Los Angeles Memorial Coliseum in Los Angeles, Calif. on September 27th, 2018 (Hiro Ueno/Rams). Los Angeles Rams wide receiver Cooper Kupp (18) catches a touchdown pass during an NFL Week 4 Football game against the Minnesota Vikings. The Thursday Night Football game was simulcast on NFL Network, FOX, and Amazon Prime Video at the Los Angeles Memorial Coliseum in Los Angeles, Calif. on September 27th, 2018 (Hiro Ueno/Rams).